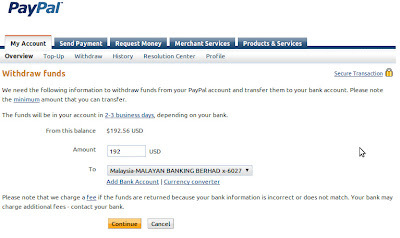 Actually I promised to write entry on Cash Out money from PayPal to Maybank account more than a year ago. I have to wait until I have enough money to show you guys. Hehehe. Just kidding! I did transfer USD 50 to my Maybank account. but totally forget to update about it. First you must add local bank accounts (saving or current) to your PayPal account. Its easy if you follow the step. There are slightly different between cash out money from PayPal to Credit/Debit Card and to your Local Bank Account. (For my example here I use Maybank account). 1. Cheaper – Its cheaper to withdraw money to your local bank than your card. PayPal will charge you RM 20 if you use your card. If you transfer money to Bank Account more than RM 400 it will be FREE and RM 3 for less than RM 400. 2. Save Time– 2-3 working days for Bank account and up to one week to transfer money to your card. 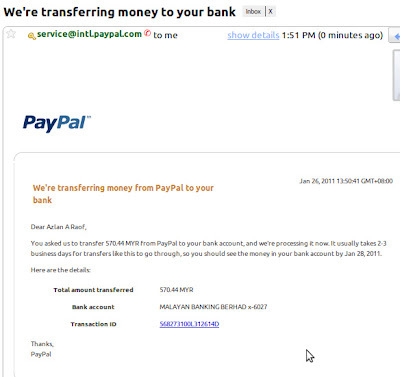 Conclusion : Save time and money to transfer money from PayPal to your local bank account. TODAY, I am so generous to share my experience with you step by step on How to transfer money from PayPal into my Maybank account for the first time that is more than RM 400 : ). You will receive email notification that your withdrawal is in process. So now we need to wait for 2 working days. 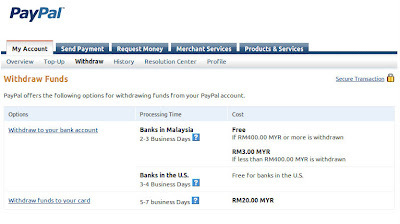 Let see now, I withdraw money from PayPal on 26th Jan 2011, Wednesday. bro, ada tutorial untuk add bank account maybank tak? Thank you so much, this has helped a bunch! You can send money to other people thru PayPal to PayPal. But why do you want to send cash from PayPal ? Just transfer from PayPal to your Maybank account then transfer to his Maybank account. That will be easy. how much will maybank charged after the transfer?or they will not charge at all? I never really check how much Maybank charged, because the USD rate that they use a little bit lower. Maybe they earned from that. Other than that they don’t officially charged for transfer. hello..cmne nk check detail akoun kita slepas da transfer dri paypal > maybank? nk check detail maybnk yg ditransfer tu??? tkde problem bro, boleh cek kat transaction history. Ada problem tak dgn Last Name, First Name tu? Do they check n match the Name exactly ke tak? Kena sama I think. Dah try blum? Hi, could u pls help to clear my confusion here? I actually dont get it, wht does it means transfer to bank account? does tht mean i have to go to the bank, to the counter, fill up form n then withdraw the money from counter? does tht means i cannot withdraw the money from atm machine? Thank you so much as it make the whole thing lot easier! I am added Maybank account into my Paypal. Have you check your Paypal account? Have you verify with Maybank? If Paypal verified it, your Maybank account will be stated. Hi! I’m totally new to PayPal, still thinking to register one. Do PayPal charge any interest/annual fee? And also the money in PayPal, after how long then we can transfer the money to our local bank account? Basically Paypal will charge for international payment and withdrawing money. PayPal doesn’t charge a fee to open a PayPal account. Apa kod MEPS routing untuk Maybank? Saya cuba click detail tapi tak keluar apa2 info pun.